The upward movement of water in a plant is called-the ascent of sap. A large quantity of water is absorbed by the roots. It must be conducted upwards to the transpiring surfaces against the downward pull of gravity. The distance covered is very large. It is sometimes exceeds 300 feet as in the eucalyptus and some conifers. All this upward movement requires some mechanism. 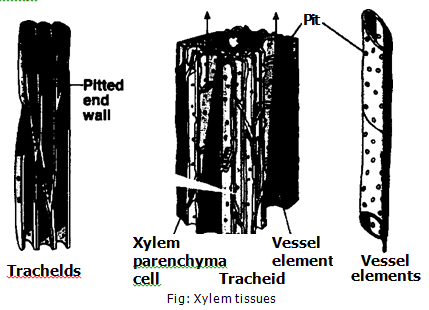 The upward translocation of water in the plant takes place through the xylem. The water rises upward through the lumen of the xylem ducts. It does not rise through the walls of the xylem. The conducting vessels of the xylem form continuous capillary tubes. These tubes extend from the roots to the leaves through the stein. They communicate with each other through pits. These pits are present in their tapering end walls. The vessels and tracheids of the outermost annual rings of the sapwood conduct water in the woody plants and trees. The heartwood plays no part. Therefore, the tree continues to live even after the heartwood decays and the trunk becomes hollow.